16th July, 8.43pm - Its 'hammer time' literally. After a 6 1/2hour drive from Kuching to Sibu and an hour shaking the cob-webs off the legs around the outskirts of Sibu, the Etor team is in Hai Bing Seafood Restaurant for the much anticipated house specialty, 'Black Pepper Crab'. 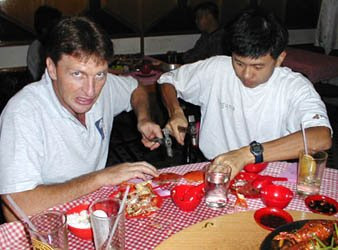 What is most amusing about this dinning experience is the use of real hammer for the job of breaking the shell of the crabs; thus the use of the phrase 'hammer time'. How apt for us mountain bikers!